Najib is certainly a man on a mission. He seems intent on trying to revive his standing by convincing his base that he was unfairly demonized by Pakatan and unjustly tarnished by the 1MDB scandal. 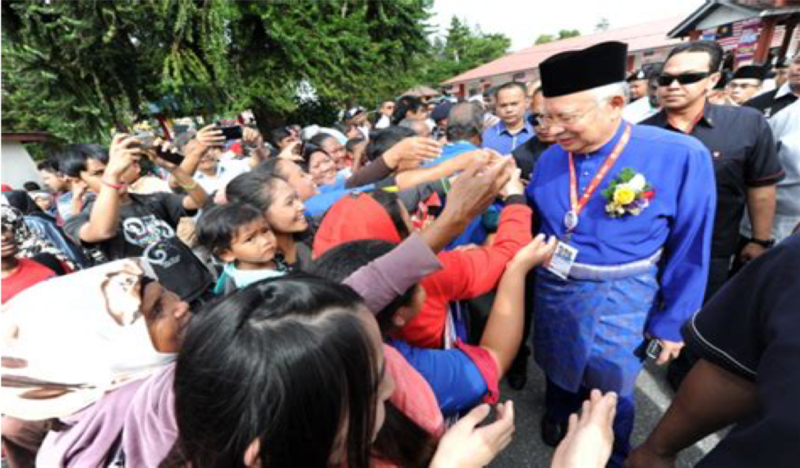 His efforts appear to be showing some results; he was mobbed by villagers in Sg Koyan and elsewhere in Cameron Highlands recently when he campaigned there on behalf of BN. And it was not just Cameron Highlands. In the last few months, despite multiple corruption charges hanging over his head, he has been more visible and more vocal than many Pakatan leaders, dishing out advice, skilfully exploiting local grievances and hammering away at Pakatan’s perceived failures. He even managed to steal the show at the Thaipusam celebrations at Batu Caves. He’s also proving adept at taking credit for everything good and blaming Pakatan for everything bad, never mind that Pakatan is struggling to clean up the colossal mess he himself left behind. But memories are short and the more gullible are already pining for “the good old days” under Najib. In Cameron Highlands, he even had the audacity to tell voters, “Don’t allow them [Pakatan] to cheat us… don’t trust them… how long do we want them to continue cheating us?” And this from the man who stands accused of cheating the people of Malaysia of billions of ringgits! Clearly, Najib may be down but he is not out yet. After all, nothing can be ruled out in politics; if Mahathir and Anwar can rise again from the ashes, so can he. Unlike other UMNO leaders who remain largely clueless, Najib understands that the UMNO brand and its formula of racial and religious exclusiveness still retains its appeal among many Malay-Muslim voters and can be weaponized against Pakatan. He knows too that his only chance of avoiding serious jail time lies in UMNO regaining power. The feudal mindset of many voters also works in Najib’s favour. They are often willing to overlook serious, even criminal shortcomings in a leader so long as he is perceived to have defended Malay rights. They remain eternally grateful to the leader for building a mosque here or a road there or for giving them a pittance in handouts while he helps himself to millions from the public purse. Pakatan has focused on bringing Najib to justice via the courts for his alleged criminal misconduct. To that end, the government has painstakingly built what looks to be a strong legal case against him with multiple charges now pending in court. If Pakatan ever hopes to win the support of Malay-Muslims, it must persuade them that they will be better off in every respect under a clean and responsible government led by Pakatan than a corrupt one led by UMNO. The full extent of the corruption and the abuse of power of the Najib administration and how it has hurt the Malays themselves must be emphasized. Just look at the substandard housing of FELDA settlers in the Cameron Highlands constituency and the hardship they still face; if corruption hadn’t robbed the nation of billions, their lives would undoubtedly be far different today. Of necessity, this is a political campaign that can only be fought and won by Pakatan’s Malay leadership. They must be more proactive in carrying the fight to the Malay heartland where support for UMNO and Najib remain strong. And not just during by-elections. Until Pakatan has firmly established itself in the Malay heartland, it must needs to be in continuous election mode and take nothing for granted. Pakatan’s Malay leadership must also take on Najib more directly. Najib is, after all, challenging their legitimacy to represent the Malays and they must confront him. It wouldn’t have escaped notice that it is Messrs Lim Kit Siang and Lim Guan Eng who are constantly attacking or refuting Najib while Pakatan’s Malay leadership remains largely silent, even deferential at times. This has allowed Najib to argue that only the DAP seems “obsessed” with attacking him, that this is somehow racially motivated. The battle against Najib (and UMNO) for the allegiance of Malay-Muslim voters is Pakatan’s biggest and most important challenge; if they don’t rise to it sooner than later, they might well be forfeiting the future of Malaysia Baru.